For high quality granite and marble worktops in Chesterfield, look no further than Affordable Granite and Marble. With over 200 years’ combined experience in the industry, we provide a service that is second-to-none, supplying and fitting only the highest quality of worktops to our customers. Come and see our showroom and our craftsmen in our fully equipped factory in Matlock. 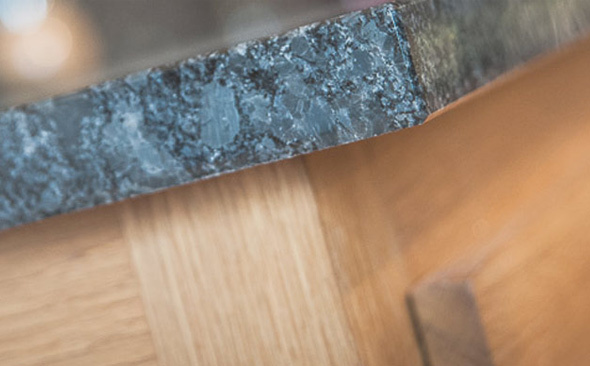 We supply high quality worktops for kitchens, bathrooms and other areas in the house, as well as a range of sinks, taps and accessories, all of which are on display at our large, well-stocked showroom in Matlock. With incredibly competitive prices and a quality assurance team on hand, we really are a leading company in our field. To find out more about any of our products or services, get in touch with our friendly team today, or pay our showroom a visit and let us advise you with any enquiries you may have. "I wanted to express my thanks to you and your fitters. The whole project has been hassle free from start to finish. Your fitters were very friendly and personable and did an excellent job of the installation with a great eye for detail. I am very happy with the finished result and won't hesitate to recommend you to others." "We have been very happy with Affordable Granite & Marble from start to finish. Service has been prompt and friendly. Your staff have been very helpful throughout, resulting in a stunning looking kitchen!" "The fitters were wonderful and the job was completed very efficiently to a very high standard. We think the value for money was excellent." "The price was great, it all happened exactly when they said and we are very pleased with the final result." "From start to finish your service and product has been excellent and will gladly recommend you to anyone wanting new worktops." "We are very pleased with the service and attentiveness your company has given to us and the resulting kitchen worktop. We would be very comfortable in recommending you to friends and family." "The worktops look fantastic. The service support and efficiency of your business is commendable and from my point of view, faultless to date." "I have recently had some Alexia gold granite worktops fitted and have been extremely pleased with the overall experience I received from customer services to fitting. It was really straight forward and the end product looks absolutely fantastic!" We cover the whole of the UK!